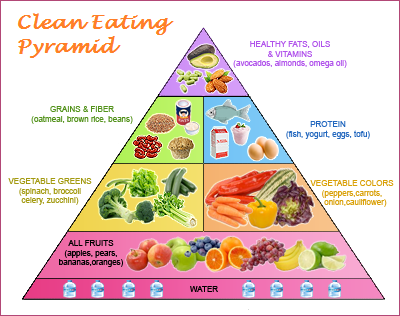 ‘Clean Eating’ is trending in the world of nutrition. It is not a fad diet; it’s a chosen lifestyle and celebrities like Katy Perry and Gwyneth Paltrow are two of the many fans supporting this trend. So, what is ‘clean eating’ and how is it good for you? Put in simple terms, ‘clean eating’ is the consumption of unprocessed food. ‘Clean eating’ consists of whole food – real food – from its origin to your plate. It does not mean eating only raw food. Some whole foods benefit from cooking because it removes toxins and kills bacteria. However, with the exception of food like white meat (which needs to be cooked through), it is best not to over-cook your food cause you lose out on nutrients. What are the benefits of ‘eating clean’? Plant-based diets are good for you. And ‘clean eating’ is mainly made up of fruit and veg. Is that a good enough reason to ‘eat clean’? How do you ‘eat clean’? If you would like to ‘eat clean’, avoid processed foods. ‘Eating clean’ begins at the supermarket. Carlos Monteiro, professor at the Department of Nutrition at the School of Public Health, University of Sao Paolo says, processed foods claiming they contain “less fat”, “less sodium” or “vitamin enriched” are bad for you. This is the manufacturer’s cunning plan to make highly-processed food look ‘healthy’. Foods containing genetically modified organisms (GMOs) are also a big NO NO! GMOs are linked to cancer and infertility. Just in case you’re not put off by processed foods yet, bear in mind that additives in highly-processed food make you crave junk food. What is considered to be ‘clean’ food? ‘Clean’ food is unprocessed food such as fresh fruit and veg, dried legumes, nuts and farm-fresh eggs. Organic food can be costly. But when possible choose organic to avoid pesticides, hormones and chemicals in your food. Wild and sustainably-caught fish have higher levels of omega-3 fatty acids. Whilst grass-fed livestock is also rich in omega-3 fats. If you are unsure of the origin of your food, ask where it’s coming from. How do you cook ‘clean’? Cooking ‘clean’ is easy. The secret is – keep things simple and avoid fats. You will soon learn how to appreciate the good taste of ‘clean’ food. Sauces and gravies musk the taste of your food and increase your waist line. Food portions play an important part in your ‘clean eating’ lifestyle. Do not over-eat; aim to have three fifths of your plate full of veg, one fifth of protein and one fifth starchy carb. And you wondered how celebs look good? Now you know how … enjoy! Next Next post: Carbs and weight gain: myth or fact?